The Crew 2 finally git its release date: it will land on PC, Playstation 4 and Xbox One on June 29th. In a few months players will be able to board cars, bicycles, boats and planes to explore America far and wide, take part in races and events to become the undisputed champion of motorsport on land, air and water. The title will debut in the inevitable standard version, accompanied by three editions including Standard – priced at $59.96, Deluxe – priced at $69.99 and Golden edition with 3 days early access for $109.99, and all three editions are can be pre-ordered through Amazon online store. 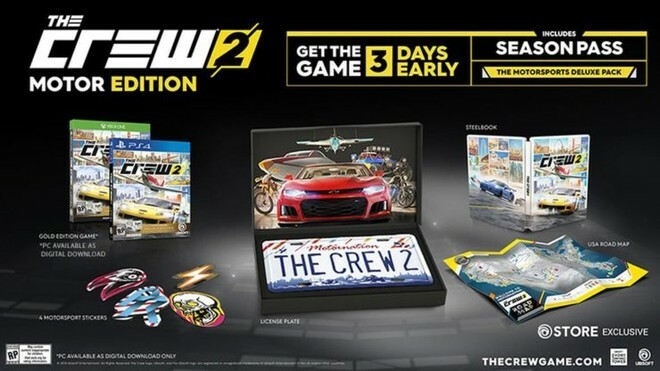 The special edition also includes extra content including Season Pass, Motorsports Deluxe Pack and a series of truly unmissable items (American Targa, Official Game Roadmap and Steelbook). The three-day early access will also be guaranteed to all players who purchase the Gold Edition containing Season Pass and other in-game content including the Motorsports Deluxe Pack. Recall that the registrations are also open to participate in the beta that will take place on PlayStation 4, Xbox One and PC. As always, registration is very simple and go to the game site (Link), select the preferred platform, log in with your Ubisoft account (or create one) and click on “Register Now”.